Japan used to be foreign to me, but after living here for more than 7 years, it’s very familiar. However, there are times that I see things that feel foreign to me. I lived in the Ofuna area of Kamakura for 4 years, and ever since I moved to Fujisawa, I’ve returned to find changes. That’s one thing about Japan, there’s constant redevelopment happening. When people move out of their old house, it’s usually demolished, then replaced by a couple newer, narrower, taller houses. Since moving from Ofuna, I have seen that several new buildings have been constructed, some torn down, and some renovated. The building right next to my old apartment is gone, and is currently surrounded by a white construction fence. 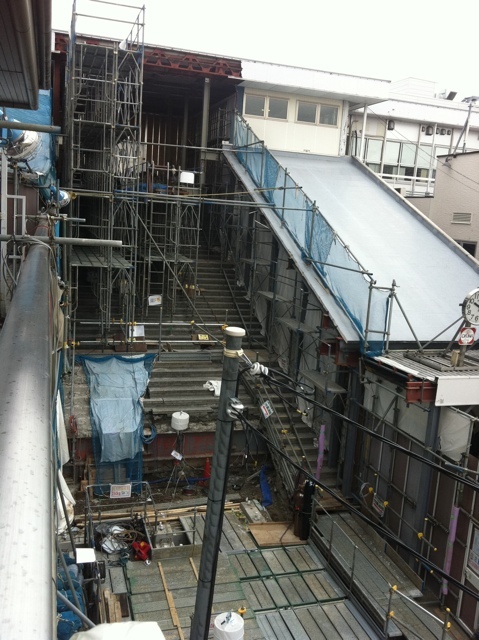 Probably one of the most noticeable changes near Ofuna Station is the demolition of half of the station’s main entrance staircase. They’re installing an elevator. But this is what makes things so foreign to me. As things slowly change, my familiarity with the area decreases, even though I return there on a weekly basis. This is certainly foreign to me. This post was inspired by the Weekly Photo Challenge at WordPress’ Daily Post blog. On September 30th, there were two events. One was local, the other was major. 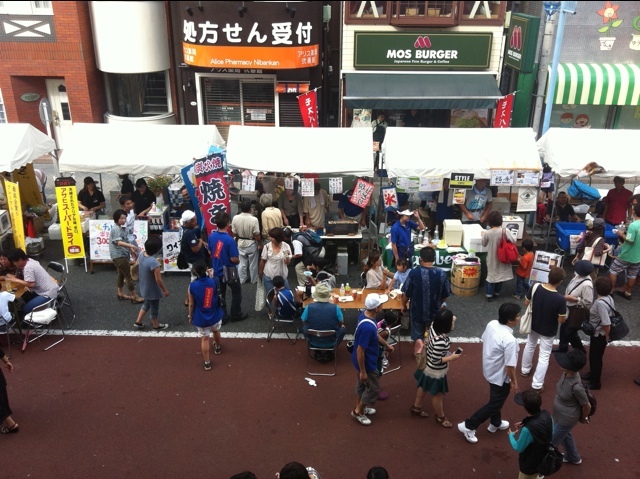 First, in Ofuna, Kamakura, there was a big festival. 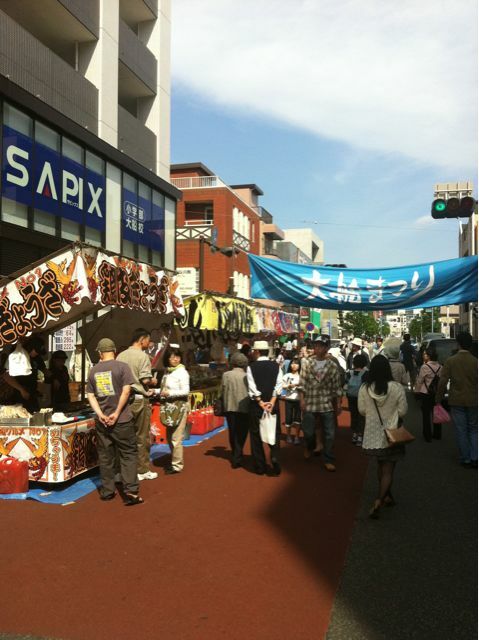 This was the Sanma Festival. Sanma is the Japanese name for a fish called Pacific saury. 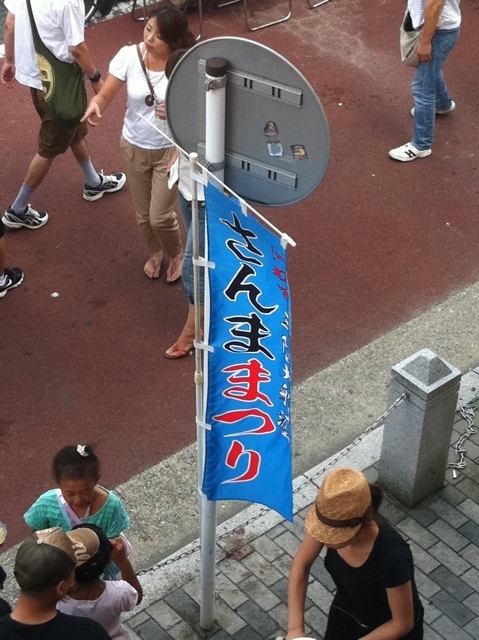 But not only was this a festival about a small fish that’s grilled on a stick, it’s also a friendship festival between Ofuna and the city of Ofunato in Iwate prefecture. Ofunato was one of the cities devastated by the tsunami of March 11, 2011. Ofuna and Ofunato share the same kanji (大船 and 大船渡). I managed to take a few pictures of it that afternoon. 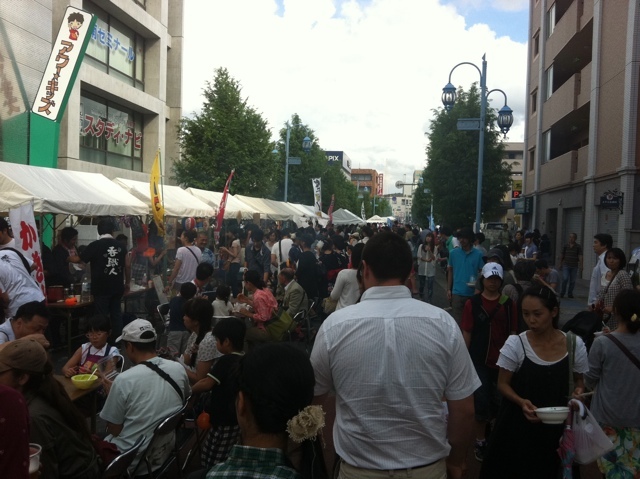 It’s a busy festival with lots of food. 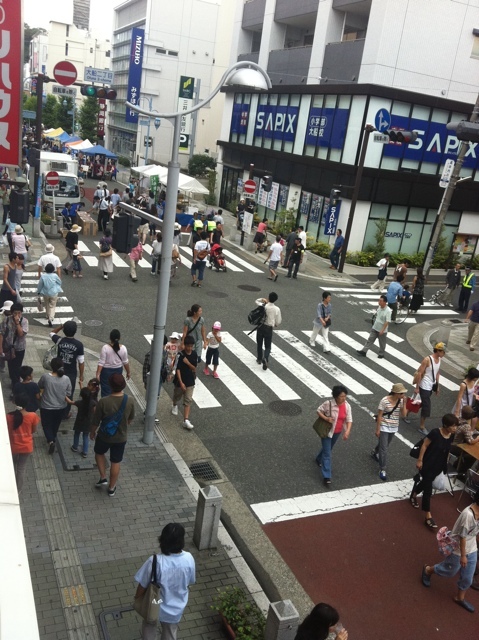 This intersection was being controlled so festival-goers weren’t hit by traffic. Finally, a picture from down on the street. The festival ended at 3pm, which is quite early. The reason was that Typhoon 17 (Jelawat) was on its way. When it hit Okinawa, it was equivalent to a category 4 hurricane, and was called a super typhoon. There was plenty of damage and power outages in Okinawa, but in the Tokyo area, we didn’t have to worry very much. It rained a lot and the wind was strong, but it was pretty brief. 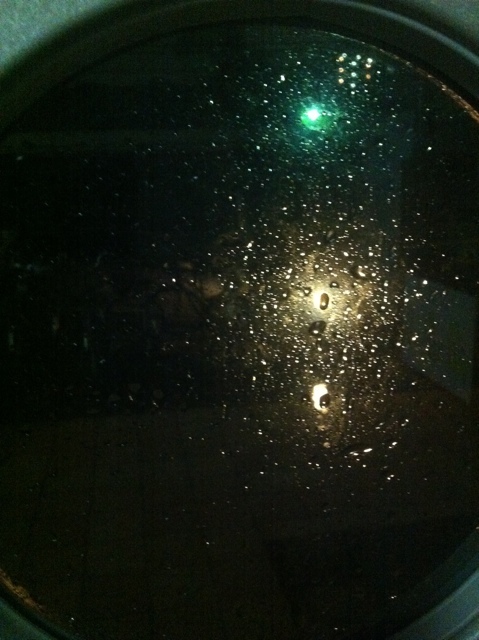 A wet window during the typhoon. The festival season is starting already. Summer is on its way! 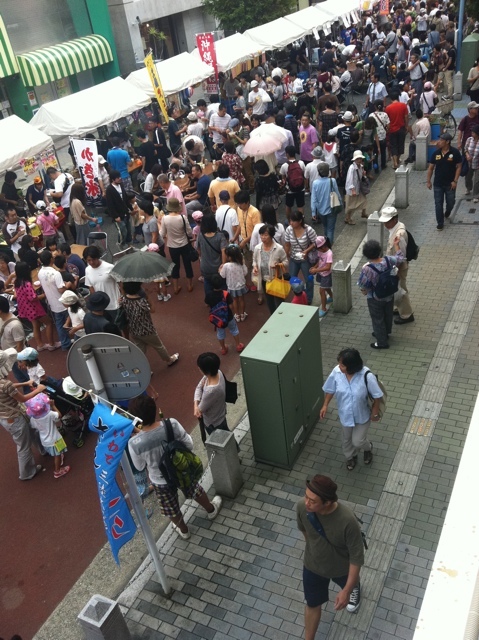 Last weekend, Ofuna in Kamakura held its own festival, the Ofuna Matsuri. It’s very small, only covering one city block and consisted of a handful of food stands, a brass band from a junior high school and a parade that featured Miss Kamakura. I didn’t stay for the festival, but I walked through it. This is about one third of the food stands at the festival. Sorry for the lack of posts this month. I hope to be getting back to posting pictures very soon. But for now, here’s this week’s picture. This is outside Lumine Wing, the big department store in Ofuna. The building curves on one side. This is just a quick picture of something I see everyday. 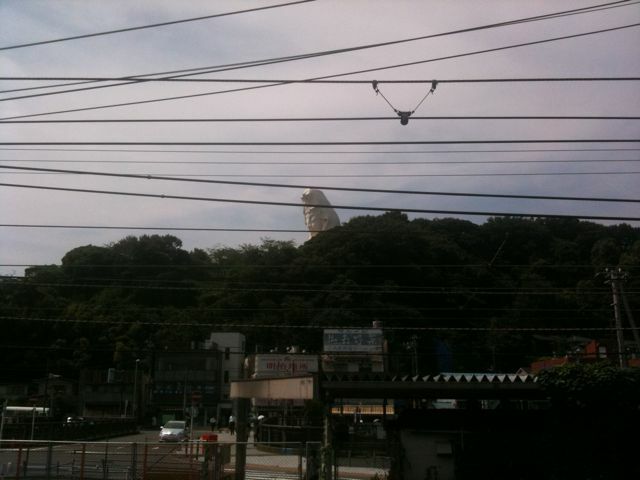 Near Ofuna station is the Ofuna Kannon. It’s a large, concrete statue of the goddess Kannon. You can actually go inside it. It’s at Ofuna Kannonji, the temple’s name. 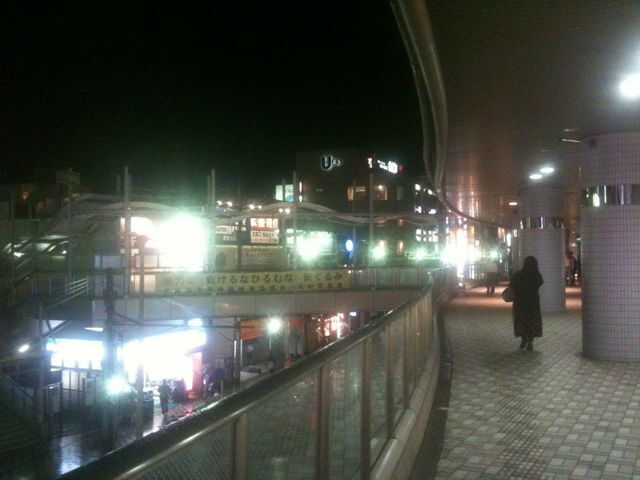 This picture was taken yesterday from the Tokaido line platform in the station before I went to watch sumo. This is a picture of a pachinko parlour next to Ofuna station. Pachinko is a kind of game in which you spend money to win some small metal balls, then trade them for a prize. Pachinko parlours have both pachinko and slots. In Japan, gambling is illegal. Pachinko parlours get around this law by offering prizes, instead of money. Of course, there are only two legal ways to gamble in Japan, the lottery and horse racing. 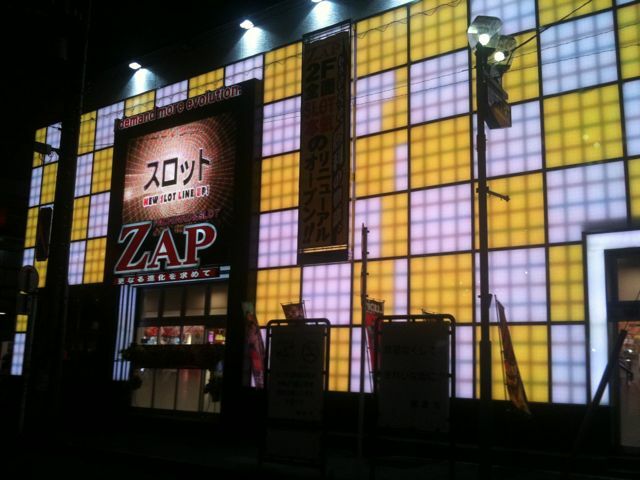 This pachinko parlour is very modern, and has multi-coloured light panels on the outside and a big video screen. The light panels have been mostly yellow and white lately, but they can also be other colours. And no, I’ve never tried pachinko. The lights on the outside are constantly changing to make different patterns of colour. 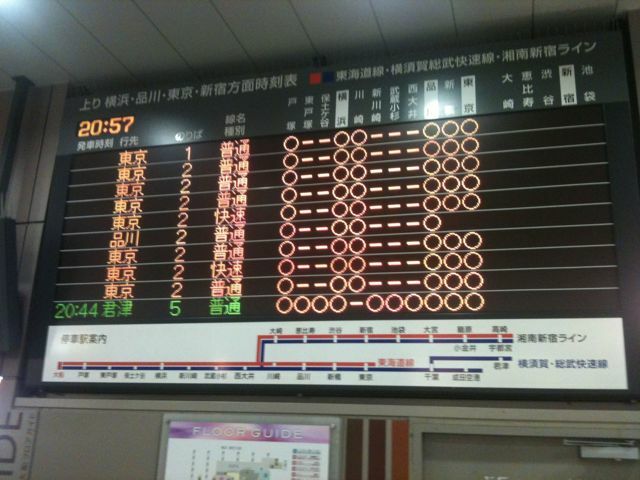 One of the effects of a typhoon in Japan is train delays. There’s a storm going over Japan right now that was a typhoon, but is now a tropical storm. As I was coming home, I couldn’t take the Tokaido Line, as it was stopped or delayed. I wasn’t sure. So, I took the Yokosuka Line, which travels in the same direction. The train was absolutely packed. It was so full that many people were unable to get on the train, so they had to wait for the next train. On the train of 15 cars, there were probably more than 2000 people on board. When I arrived at my station, I saw the Tokaido Line and Shonan-Shinjuku Line schedule board in the station, and noticed the backup of 9 Tokaido Line trains. That’s 1 1/2 hours behind schedule, and none of them were running. The Tokaido Line had been stopped for quite some time. Unfortunately, that line frequently stops for weather related issues. I took a picture of the schedule board, which is below. The orange ones are Tokaido Line on platforms 1 and 2. The green one is the Shonan-Shinjuku Line on platform 5, and it had a time listed. Notice that it’s 13 minutes behind schedule. Weather like this really makes the normally very punctual Japanese train system into a mess. The orange is all Tokaido Line. There are no times listed for them, so it's stopped, and 9 trains behind schedule!